The Crowne Plaza Englewood where I made my reservation. My name is Karin Willison, and I’m a travel blogger. I have been disabled since birth by cerebral palsy and use a power wheelchair. I road trip across the United States sharing my experiences with sightseeing, theater, hotels, and more. I particularly focus on accessibility for people in wheelchairs. I have been a frequent customer of your hotel chains since 2010. In the past I have found that Holiday Inn and Crowne Plaza provide excellent wheelchair access and comfortable rooms for a reasonable price. In particular, you offer rooms with wonderful roll in showers that work well for my needs. 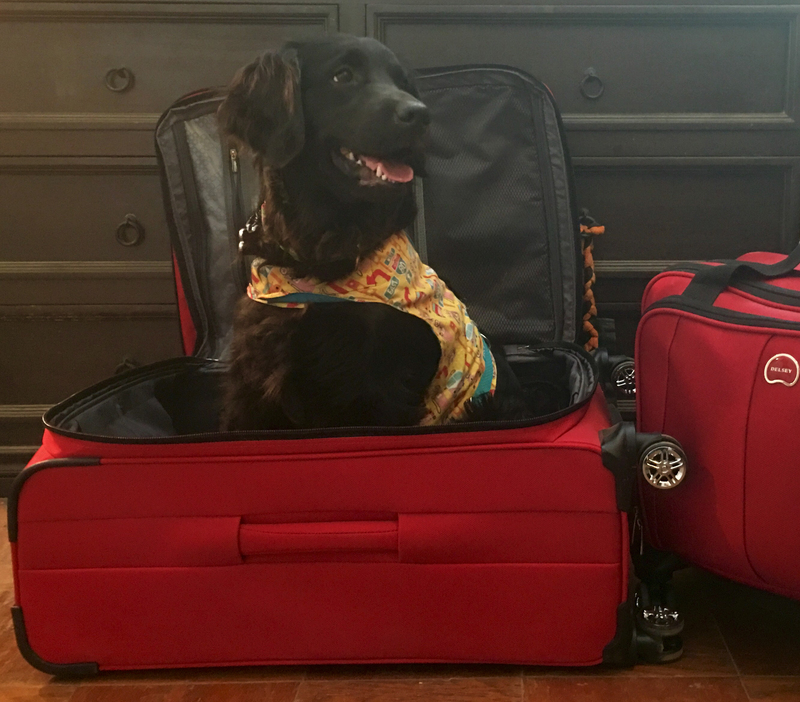 I travel with a personal assistant and absolutely require a roll in shower in order to bathe safely. 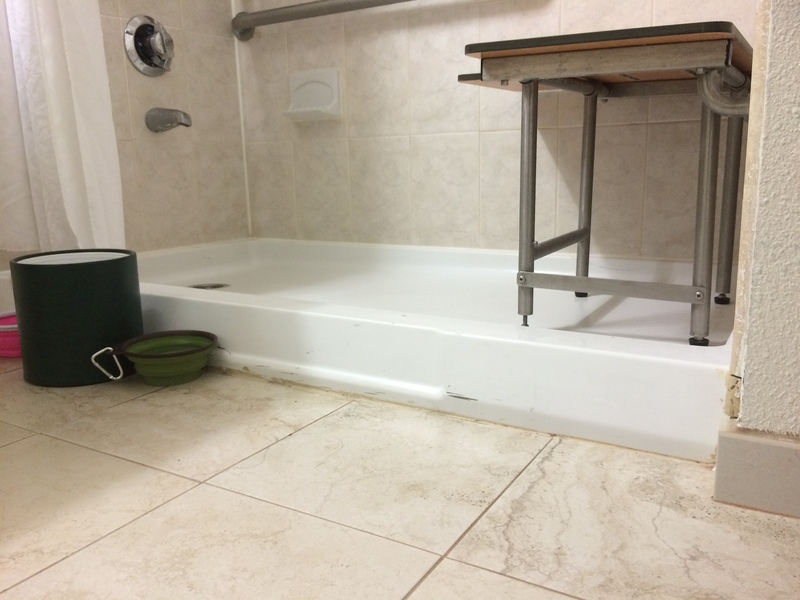 It’s difficult for me to get into a bathtub, even with help and with a bath seat, whereas with a roll in shower and built-in attached seating, I can park my wheelchair right next to the seat and easily transfer with assistance. 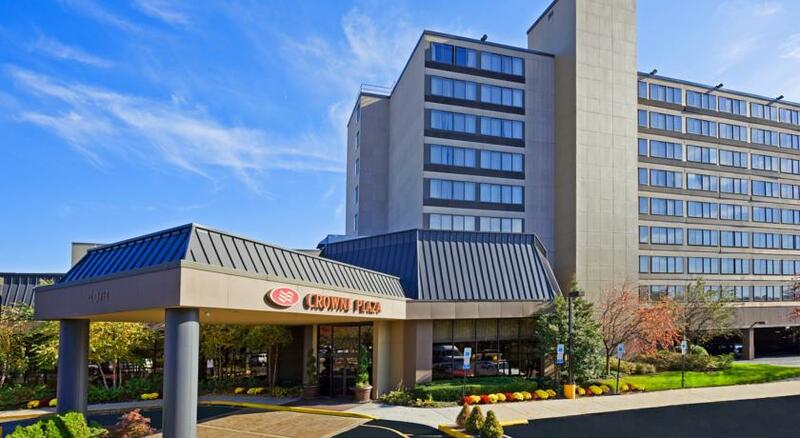 I stayed at your Crowne Plaza Englewood New Jersey location in 2011 for two weeks and had a positive experience. The location had a room with a roll in shower, and it was great for me. So naturally when I decided to book a trip of similar length from July 17 to August 3, I chose the same hotel. I went online and specifically selected and booked the roll in shower equipped room. Here you can see my screenshot of the reservation I made via your website. Since you only had a room with one bed, I also requested a rollaway bed. As I have had some problems with getting rollaway beds in the past, I called the hotel to confirm, and also make sure that I would have the roll in shower room. They said that it would all be fine. 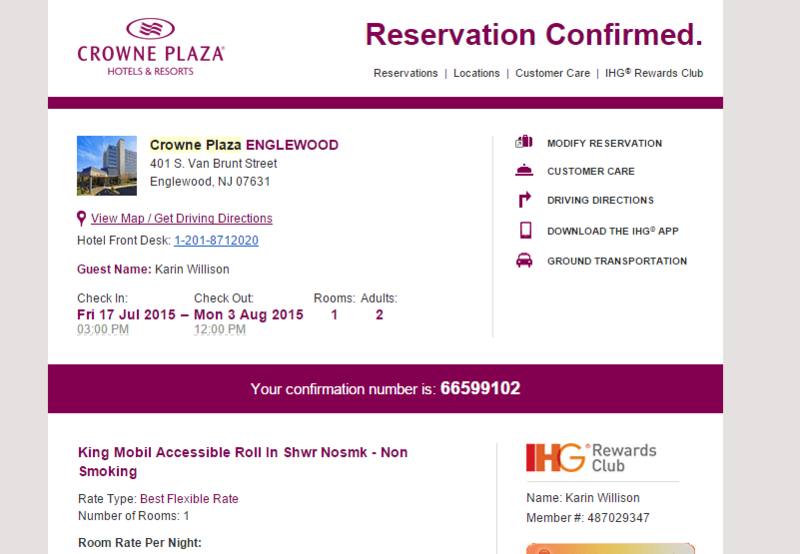 We arrived at the Englewood New Jersey Crowne Plaza at approximately 6:30 PM on July 17, 2015. We went to check in, and were told that we had an executive king room. I said that wasn’t what I booked, I booked the wheelchair accessible roll in shower room. The manager on duty then looked through the bookings and said that there was not a roll in shower room available for two days. He only had rooms with bathtubs. I said that was not acceptable, I’ve been traveling for two days and need to be able to take a shower. However, I did look at two different rooms to see if they would work for me. Unfortunately they would not. I asked him to relocate the guest in our room so that we could have the room that I booked, but he was not willing to do that. I then asked him to call some other area hotels in the IHG network to see if they had a roll in shower room available. He called the Holiday Inn in Fort Lee, New Jersey, who said that they did. He then transferred my reservation over to them. The supposedly accessible shower room we were given at the Holiday Inn Fort Lee, NJ. Unless your wheelchair is an ATV, this isn’t a roll in shower! I arrived at the new hotel, and found it to be not nearly as nice as the Crowne Plaza. It’s older and a bit run down in some respects, and not well maintained. I have certainly stayed in other similar hotels in the past by choice, but it felt offensive to be sent to a hotel that was a lower quality than what I had booked. They gave me keys to the room, and we went upstairs only to find that once again, there was a bathtub. We went back down, got a second key, and found yet another bathtub. Finally on the third try, we were given a room with a shower. We took this room for the night, but as you can see in the accompanying picture, it is in no way a roll in shower. It has about a 2 inch step, so it is impossible for me to park my wheelchair close enough to the bench to transfer. If I align myself as closely as possible, there is still an 8 inch gap between my wheelchair and the shower seat. Therefore, I cannot shower in this room. If I park next to this shower, there is an 8-inch gap between me and the seat. I called the IHG main customer service line first thing this morning, July 18, and they called the Crowne Plaza. The Crowne Plaza is paying for me to stay one more night at the Holiday Inn, and then I will be back at their hotel in an appropriate room with a discount for the length of my stay, Plus free breakfast. They also said that the people currently using the roll in shower rooms are in wheelchairs, so it wasn’t a case of them giving the rooms to someone without a disability. That’s somewhat of a relief, but it still shouldn’t have happened. The management of the Crowne Plaza says that they will be looking into what went wrong. I’ll be making sure that they do. The Americans with Disabilities Act requires that hotels offer some rooms with roll in showers, and some with bathtubs. This is not an arbitrary rule, it exists for a reason. People with disabilities have varying needs. For some people, either type of room may be OK, or sometimes OK (I will occasionally book a bathtub room if I’m only staying one night and it’s the only room available), but generally guests need either a roll in shower or a bathtub, and they specifically book a room with that amenity for a reason. Arbitrarily changing a person’s reservation for an accessible room because you overbooked the hotel (the excuse given by the hotel manager) is not acceptable customer service. Telling a person that you have a room with a roll in shower and then sending them to multiple rooms that have bathtubs, because employees don’t understand the differences in room types, and/or your system doesn’t have the room types properly listed, is not acceptable customer service. Treating someone who booked a 17 night stay in your hotel in this manner is completely unacceptable. I’m posting this publicly because I’m a blogger. 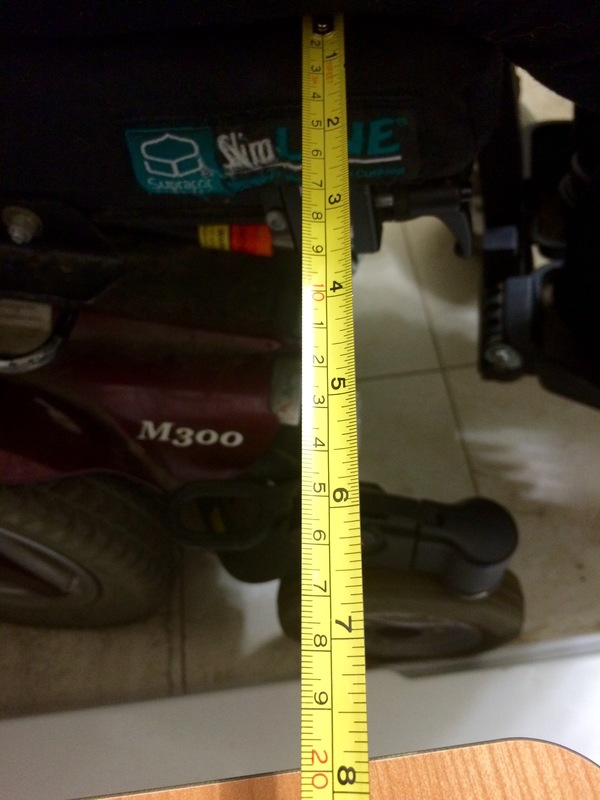 I blog about my experiences and I feel that people should know that even when you book a wheelchair accessible room of a particular type with the IHG hotel chain, you may not get it. If I’d had an evening appointment, I would’ve missed it in trying to find an acceptable room. As it is, my assistant and I are tired and won’t be able to enjoy the full day we had planned. And of course, I still can’t shower until tomorrow afternoon when we can switch hotels. I have received some compensation for my inconvenience, in the form of a free night, further discounted stay, and free breakfasts. After all that I’ve been through, I think it is only fair. But this can’t be fixed by throwing money and free stuff at me. It can only be fixed by a long shower in an accessible room, and the knowledge that this will never happen to me or anyone else again. I want to hear from you about what steps you are taking to ensure that your locations reserve the correct rooms when people book them, and do not overbook accessible rooms. I would also like to have a timetable for when the Fort Lee Holiday Inn’s shower room will be modified to truly be accessible. If I can help with any of these things, I’m happy to do so. I enjoy consulting with businesses on how to improve their wheelchair access. I see that as part of my role as a blogger. I just don’t want to have to do it on a Friday evening after I’ve been in the car for two days and want to check into my room and take a shower. No one should be treated in that way. Especially not someone who booked 17 nights at your hotel. I would appreciate a prompt response to this matter. See the continuation of this story on the update on the Crowne Plaza Englewood ADA violations page.